Better blending—in less time. Stop wasting your valuable time and money on outdated, oversized, and underperforming mixing systems. The OME Powder Mixer provides quick, high-performance blending of wet and dry ingredients into a fluid stream. 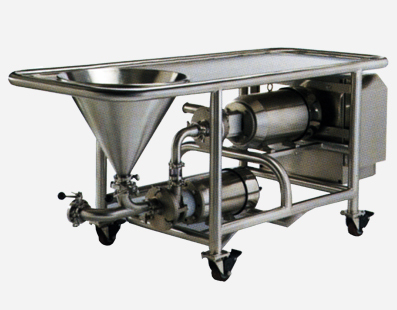 OME Powder Mixer incorporates the uniform powder induction of the liquid ring pump and thorough blending of the Shear Blender into a single, compact system. The pump is unparalleled as a self-priming pump, easily pulling liquids and solids together. The table’s full-port valve inducts powders fully, eliminates powder bridging and ensures maximum powder induction rate. Vacuum gauges monitor suction for repeatable results. Using an intermeshed rotor/stator system, tight gaps at high speeds and high turbulence the Powder Mixer achieves a complete and consistent mix, time after time. Smaller models are portable, with locking wheels. The Powder Mixer can be moved easily to different processes as needed. The Powder Mixer operates at floor-level, eliminating dangerous ladder climbing or accidental falling or dropping of equipment from mezzanines. Also, with its waist-height funnel top, there is no bending to pour.